The Alabama coaching staff named its Players of the Week for the week of the 35-0 win over Western Kentucky. Here are the winners. Offense: AJ McCarron and Kevin Norwood. McCarron tied a career-high with his four touchdown passes on his way to a 14-for-19, 219 yard performance. He is also tied-for-sixth in program history with 95 straight passes without an interception. Norwood caught two of McCarron’s touchdown passes, catching 33- and 12-yard passes. He finished with 3 catches and 92 yards, plus a 22-yard kickoff return. Defense: C.J. Mosley and Nico Johnson. Mosley led the team with 11 tackles, seven of the solo efforts, with a sack and a pass break-up. Johnson added tackles, four of them by himself, with a sack and a pass break-up. The duo helped the Tide throw its fourth shutout in its last 13 games. Special Teams: Cade Foster and John Fulton. Foster kicked three touchdowns in six attempts to average 67 yards per kickoff and net 46.7 yards per. Fulton, outside of making his first start as a cornerback, had a tackle inside-the-20 on the kickoff coverage team and ended the game with three tackles. Fun news, readers. Since we are now one week into the season, we now have information from the Southeastern Conference to add into these posts. 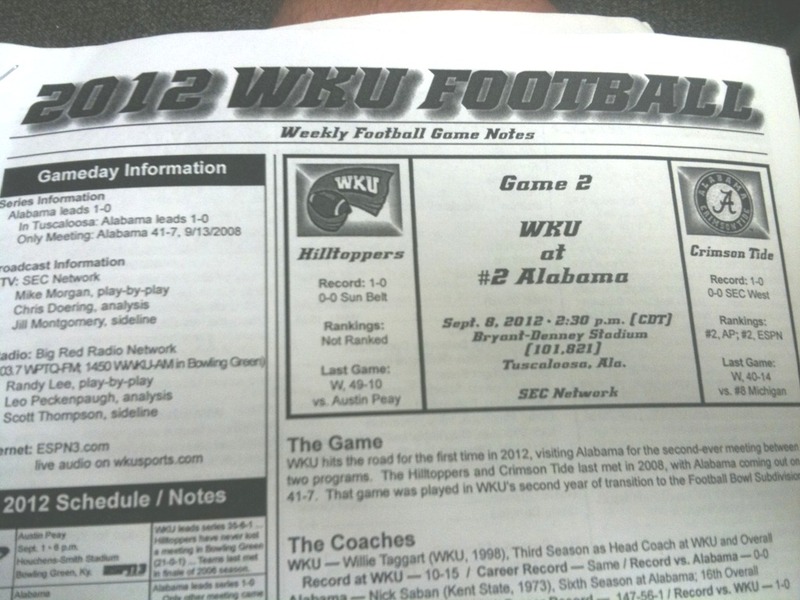 Also, Western Kentucky sent their own media guide to Tuscaloosa. 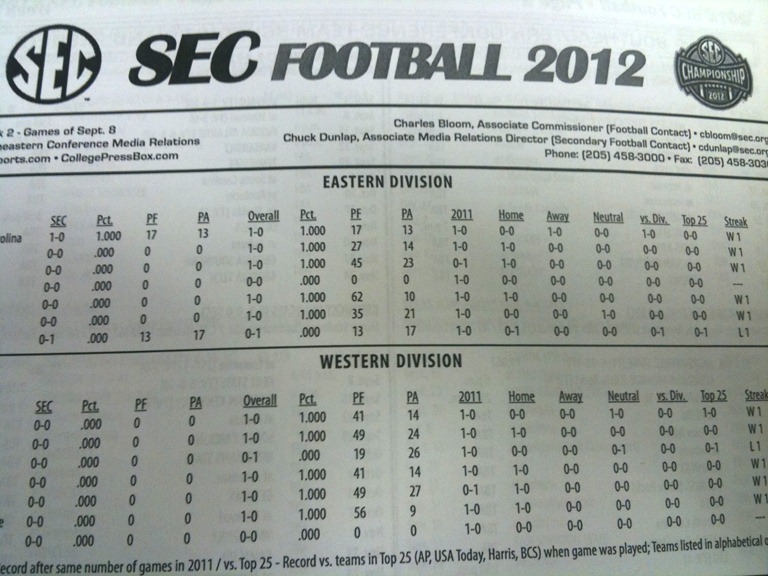 We’ll get to that later, but right now, we’re beginning with the Alabama media guide. We Meet Again: Alabama won the only previous meeting between these schools, a 41-7 win for the Tide in 2008. Making History: T.J. Yeldon was the first freshman running back to ever run for over 100 yards in his debut for the Tide. He is already closing in on the most 100-yard rushing games under Nick Saban, as the leader is Trent Richardson with 13. Running It Up: Alabama has now scored 70 unanswered points, dating back to early in the third quarter of the 2011 Iron Bowl. Saban Owns September: Under head coach Nick Saban, the Tide are 21-2 in September. Both losses came in Saban’s debut in 2007, when Alabama lost to Georgia in overtime and Florida State after beating Western Carolina, Vanderbilt and Arkansas. Hanging With His Peers: AJ McCarron has the fourth-most offensive yards gained among active SEC players, with 3,188. Tennessee’s Tyler Bray is in third, Arkansas’s Tyler Wilson is 2nd and Aaron Murray of Georgia is the leader. Not Today: Alabama CB Dee Milliner has more pass deflections than any other active player in the Southeastern Conference, with 20. He is one ahead of Mississippi State’s Johnthan Banks and three ahead of Charles Sawyer of Ole Miss. The all-time leader is Corey Webster with 49 and he needs 16 more to crack the top 10, to be in a tie with Vanderbilt’s Robert Davis and Sheldon Brown of South Carolina. Sizing Up: The Hilltoppers’ starting offensive line clocks in a 6-foot-4 and 304 lbs, which is 8 pounds more than the average starter on the Alabama defensive line. The average starter on Alabama’s offensive line outweighs the average Hilltopper defensive line starter by 12 pounds. Can’t Keep Them Out: Western Kentucky touts a streak of 120 games without being shutout, including in its last visit to Tuscaloosa in 2008. Hometown Hero: Western Kentucky head coach Willie Taggart was a All-American quarterback in his days as a Hilltopper. He set 11 WKU records as the starter (four of which still stand) and had his jersey retired in October of 1999. The Old Breed: The Hilltoppers have three players that have made 20 or more consecutive starts: offensive lineman Sean Conway with 25, punter Hendrix Brakefield with 25 and defensive back Tyree Robinson with 22. Tight end Jack Doyle, quarterback Kawaun Jakes and offensive lineman Adam Smith all have over 30 career starts and are expected to start against Alabama. That Was Quick: Western Kentucky scored seven times against their previous opponent, Austin Peay, and never took more then three minutes and 36 seconds. Two of the scoring drives took less than one minute (five seconds and 23 seconds, to be exact), and another took one minute and 55 seconds. The most-lengthy scoring drive took only three minutes and 36 seconds of the clock, and it was in the fourth quarter when the Hilltoppers were trying to kill the clock on a 49-7 lead. In another weekly installment, Chris Dodson delve into radio to analyze the Michigan game and go into the Western Kentucky game, in addition to going around the SEC. With that, plug up your headphones and click here to listen. Follow @BrettAtBama on Twitter to be up-to-date with everything happening on the blog and @Brett_Hudson for up-to-the-second updates on Alabama athletics. The SEC announced its football schedule today, including both Texas A&M and Missouri to make for the first 14-team season in SEC history. While there are so many interesting scheduling happenings throughout the conference, I know that the Bama faithful only cares about the Crimson Tide. So, we’re going to break down the Tide’s schedule game-by-game. The Tide will open up the season by renewing the big-game rivalry of old times against Michigan in the crowning jewel of professional football, Cowboy Stadium. Michigan is a challenging opponent under head coach Brady Hoke, who has brought defensive intensity back to the Wolverine football program while maintaining explosive offensive talents like Denard Robinson. After a tune-up game against Western Kentucky, Alabama will make the trip to Fayetteville to face the Razorbacks of Arkansas after having to fall onto a Robert Lester interception to cap a major comeback in their last visit to Fayetteville. That will be followed by another non-conference tune up game against Florida Atlantic before welcoming the Ole Miss Rebels in Hugh Freeze’s first season as head coach. After a rather early bye week, the Tide will take a trip to Columbia, Missouri to welcome the Missouri Tigers into the SEC. 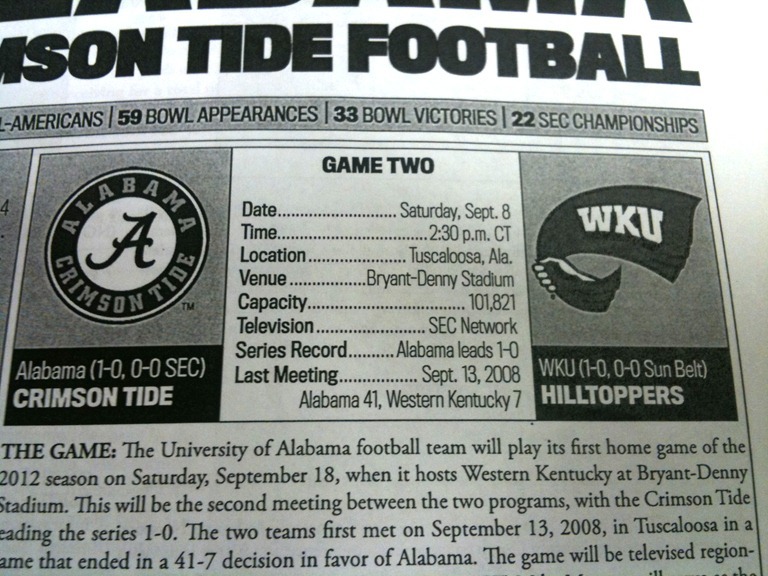 Following that game, the Alabama-Tennessee finally returns to its original date, the Third Saturday in October. Alabama will then return home to meet the Mississippi State Bulldogs before what will likely be the biggest game of the season. That biggest game of the season is Game of the Century Part III, Alabama vs. LSU in Death Valley on Nov. 3rd. The rest of November and the rest of the regular season has the Crimson Tide at home, playing Texas A&M, Western Carolina and Auburn in consecutive weeks. For more of my thoughts on the schedule, check out my guest work for Bleacher Report here: http://bleacherreport.com/articles/1002097-alabama-football-ranking-the-most-difficult-games-in-the-2012-season. Enjoy!